Add this one to the list of gentle facial cleansers that err on the gentle side. 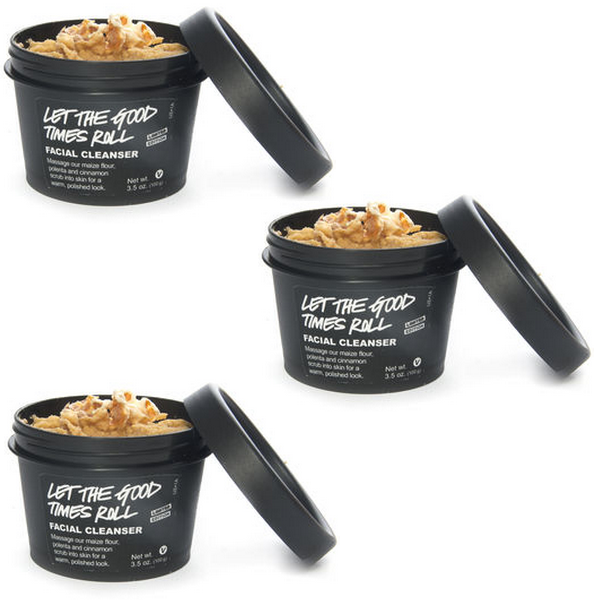 LUSH Let the Good Times Roll facial cleanser ($12.95-28.95) was introduced as a holiday limited edition, but was so popular that it became part of the regular roster. It's easy to see why: the maize flour and cornmeal-based scrub smells like a sweet, corn-based dessert confection that's good enough to eat, and provides gentle, natural exfoliation to boot. The instructions say to pinch off a pea-sized amount and combine with water, but I've been using twice that with damp hands and damp skin so that the cleanser forms a thicker paste. If you wear makeup, I also advise using cleansing oil and eye makeup remover beforehand and following up with a toner afterward. Like I said, Let the Good Times Roll errs on the gentle side in spite of its exfoliating action, and it won't do everything by itself. your product is very nice.